Supybot developers, thank you for making me laugh on a Sunday morning! -d, –daemon Determines whether the bot will daemonize. This is a no-op on non-POSIX systems. –allow-default-owner Determines whether the bot will allow its defaultCapabilities not to include “-owner”, thus giving all users the owner capability by default. This is dumb, hence we require a command-line option. Don’t do this. –allow-root Determines whether the bot will be allowed to run as root. You don’t want this. Don’t do it. Even if you think you want it, you don’t. You’re probably dumb if you do this. –debug Determines whether some extra debugging stuff will be logged in this script. When you get up at 5 to speed up something your eyes are not working in the ideal scenario. This morning I spent 20 minutes because first, I wasn’t reading calmly the how-to below and second .. and this is the one a machine can do for us, I wasn’t using colors to distinguish between a comment an a valid configuration line in a XML file. I thought the configuration file wasn’t being read and it was, but full of comments. Oh colors, you know what? I love you! you must define such a user - the username and password are arbitrary. <!.. ..> that surrounds them. One year ago three of us were freezing cold in Brussels attending FOSDEM 2012 and trying to get feedback about a couple ideas we had in order to create a start-up. Twelve months later here we are again in our way to FOSDEM, but this time we are part of Bitergia, the company we created. The creation of the start-up has been a lesson itself. During the first months of 2012 we lost count of the times we met at a very nice cafeteria in the South of Madrid to discuss the ideas about the people we wanted involved, business models, potential clients and so on. One of our main concerns during these discussions were to decide the main idea that would be the base of our business model. During our last months (late 2011) in the research group we started to receive some petitions from people interested in using the results of some research lines in their products. Offering interesting results as researchers was really nice, the new challenge started to be how to get money from that results/expertise. Advance warning: this will be one of our critical problems or opportunities. Did I talk about getting focused in the paragraphs above? One of our favourite dilemmas was to define how focused we wanted to be in our business idea. As soon as we started the company we saw some opportunities of collaborating with a couple of entities supporting and improving software forges. Since the very beginning we were very interested in Allura, Fusionforge and software forges in general, but we wasn’t sure it would be a good idea to follow that path. Time has passed and a few months ago we decided to add forges to the business idea, so currently we are working on supporting software forges and integrating them with our software analytics report. So far, the adventure is being really fun and I’m pretty sure this is because I have great partners. If someone would ask me about what lesson I extract from this first stage of the company’s life I would say: once you have the idea, look for people that support you and motivate you to grow up. Last week we attended Linux Tag in Berlin to give two talks. First one was about identifying reused code between two FLOSS projects and it was given by me. The second one explained the importance of studying FLOSS software communities and was given by Daniel Izquierdo. how different are two software projects? is it feasible to propose a merge of the code? how is the derivate project using the original code? are the licenses being respected? what about the copyright? is the new project using new licenses that could be interested for the team that created the original work? are they improving the code? what changes performed the second team on the original code? is your source code being adopted by a certain community? The presentation that was presented is available here. kudo: a statement of praise or approval; accolade; compliment. 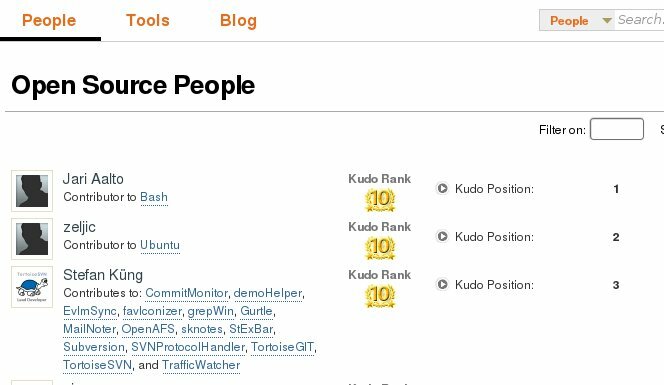 Basically, kudos are a public way to show your appreciation or respect for an open source contributor. Remember that meritocracy is a very important part of the motivation to work in libre software projects. According to the explanation by the ohloh staff, contributors who have received the most Kudos will receive the highest KudoRank of 10 and only the 64 top people can receive the highest KudoRank. Once the concept is clear, let’s have a look at the top ten contributors according to ohloh (based on the Kudos they’ve received). The top 3 committers according to the Kudo Rank are Jari Aalto, zeljic and Stefan Küng (see image below). Now, let’s compare the first three contributors. If we add up the values of the two first committers (Jari Aalto and zeljic) we have 21 commits, 2 years of experience and 6 kudos received. On the other hand Stefan Küng, who is the third contributor, has received around 100 kudos (you’ll have to count them manually), has coding experience of 8 years and 9 months and is part of 15 software projects. The obvious questions is, what is wrong here?. The first two committers have not claimed the ohloh account for this contributions, could it be the root of the bug? I think this is a bug, I’ll let the Ohloh staff know. Stay tunned. I remember the first time I had to deal with a development based on Moodle. It was more than 6 years ago but I still remember that everything was prepared to attract people and boost the creation of a stronger community. Today I had a look at the number of Moodle and the activity of its leader, Martin Dougiamas, and I have to say I am quite happy Moodle is being such a big success. Moodle has a large and diverse user community with over 1,128,626 registered users on the moodle.org site alone, speaking over 78 languages in 217 countries. As of October 2010 it had a user base of 49,952 registered and verified sites, serving 37 million users in 3.7 million courses. Currently (December 2011) it has a user base of 72,168 registered and verified sites, serving 57 million users in 5.8 million courses. Wow! “serving 57 million users”! Well done Moodle team :). There are around 50 companies that compose the “Moodle partners” network. It offers services around Moodle and help with the development. The services that they offer are: hosting, support, consulting, integration, developing of the courses, customisation and certification. 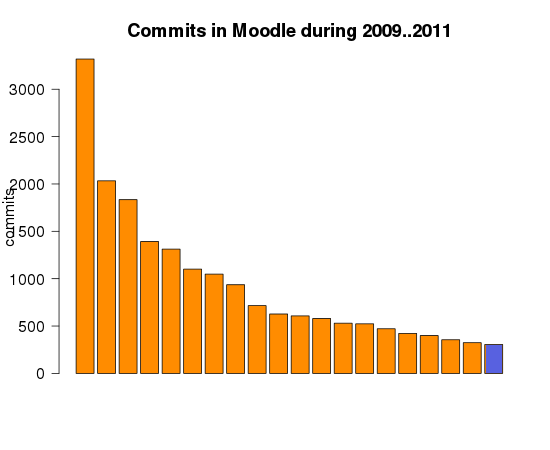 Martin Dougiamas (blue bar) is by far the person who has committed more changes to the Moodle’s source code repository. The project started in 1999 but the oldest record we have in git is from 2001. The chart on the left shows the top ten committers by 2003. 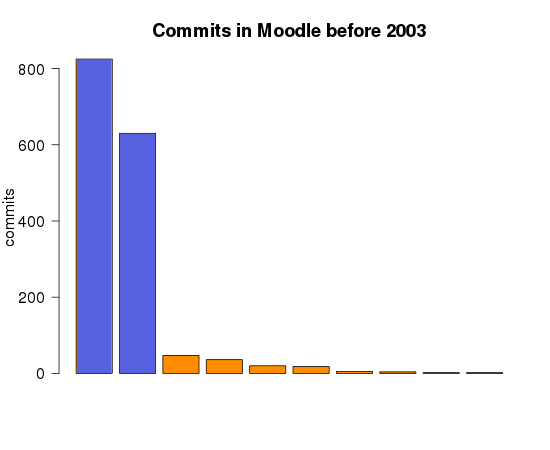 Martin Dougiamas used two different accounts (blue bars) and the rest of the developers made only a few contributions. We could say that in 2003 the community was starting to grow up and Dougiamas was still the only person that worked full time on it. The role of Dougiamas in the last two years is very different from the one he played during the first years. Currently the community has a big number of developers (238 total code committers), and there are 19 that are more active than Dougiamas in term of commits. It seems that he is dealing with other tasks but still wants to be involved in the development. 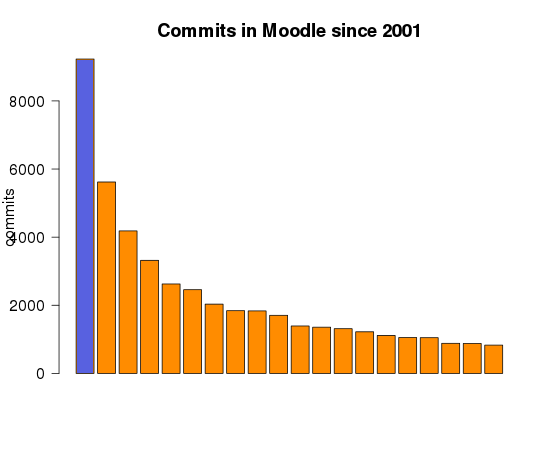 I believe that Moodle is a very interesting case to be deeply studied. If you are part of the moodle community and find any errors, please let me know. A dump of the SourceForge database created in 2005, which included more than 1,180,000 registered users. Mailing lists archives of the Debian, GNOME and FreeBSD projects. A total of more than one million different e-mail addresses. most of the total sf.net users came from Europe and North America, followed by Asia with less than 10% of the developer population. If we take into account that the population is larger in Europe, the penetration of the libre software development per capita was higher in North America than in Europe. there were more developers in the US and Canada than in most European countries or regions. On the other hand, the US had fewer libre software developers per million Internet users than most European countries. when the total number of developers is adjusted using wealth (GSD), China, India, Russia, Brazil and even South Africa are among the higher contributors. I wonder if the situation will be same by 2020.